BECAUSE MY FREEZER IS TOO SMALL TO ACCOMMODATE ALL THE TOMATOES I’VE HARVESTED, I’ve decided to learn a new skill: waterbath canning. And to make the job as easy as possible, I ordered the nifty canning-kit you see pictured above. Of course, I purchased an extra kit for you. Would you like a chance to win it in a random drawing? Generations of food-preserving-enthusiasts (including my mother and her mother) have used Ball’s canning kit. 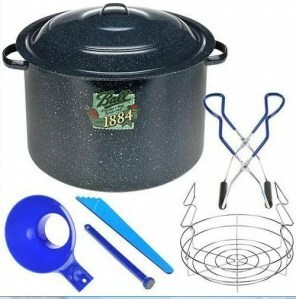 The product features a 21-quart capacity enamel waterbath canner, plus these really cool doo-dads: a funnel for filling the jars; a magnetic stick for retrieving heated lids; a plastic stick for removing air-bubbles; a chrome-plated rack for lowering jars into the canner, and a rubberized tong-device for lifting jars from their hot bath. 1. Sign up (if you haven’t already) for my weekly email newsletter. 2. Leave a comment below. Tell me what you’ve already preserved from your garden or farmers’ market, or what you would preserve, if only you had this kit. If that’s too much trouble, just say “Hello.” In any event, leave your email address (or just a portion of it) so that I can easily verify you’ve subscribed to my newsletter. 3. Click the Facebook “Like” button below. Enter soon! This drawing ends at 11:59 PM on Saturday, September 10, 2011. I’ll announce the winner at the end of the comments; the winner will also be contacted by email. As always, I’ll let Random.org select the winner. My first canning adventure was just one month ago. I put up 5 quarts of homemade tomato sauce. It was quite a learning experience but it is all part of getting back to basics. As my journey continues I anticipate greater yield from my garden, more “put up” foods in the pantry and a greater satisfaction with Life in general. Our move to North Carolina has brought a greater balance to our lives and this is just part of it. Ohh I can , tomatoes , Salsa, Green beans,Tomato jam,Tomato sauce, Tomato paste, I pickle, garlic , Saurkraut, Pickles, My water bath canner is so old it is kinda getting rusty, I was telling my hubbs I so need a new one , I love the flat rack, it can be used with the europen jars alot easier 😀 I could use this and If I don't win I'd love to know where you got it 😀 Partial email is w8in4 , You have a very nice blog !! I have been freezing herbs in olive oil because I am afraid to do any canning without the proper equipment. I would like to can some tomato paste and tomatillos that I am about to have a gazillion of! I want to try to be more self sufficient and learning to can would certainly help! I'm one of the weirdos who does not like fresh tomatoes-but I'd love to be able to make something with them and can it! Wow, I could use a new canner mine is 30+ years old. It has been put to great use this summer already and at this point two would be great. I also enjoy reading anything on gardening, preserving, day=today country life. We haven't learned how to can tomatoes yet- don't have the kit! That's definitely #1 on our list. Also, we're gettin' hitched on the 24th so it'd make an awesome wedding present (hint, hint!). I've never canned before, only frozen, so I'd love to win this kit and try my hand at canning! PS: I get your weekly newsletter (and LOVE it!) and like you on FB. My canner gave out this summer. Finished tomatos and peaches before it was finished. I can so many things that I really could use a 2nd one so it doesn't take as long to get it all done! My wife and daughter carry canned goodies to the nursing home that they both work at, and the residents there just love them. This looks wonderful. I've never tried canning, but have always been curious. I too have so many tomatoes this season and would use this on those. Plus pickles sound delicious! Email subscriber, viva… happy labor day! Would love to have this canning kit. I only freeze because I don't own one. Last year I conquered knitting and what a satisfying and relaxing thing it has turned out to be. I have a feeling canning would be just as awesome. I remember helping to prep the food to be canned when I was under twelve. The rest of the process is a mystery to me. I would can tomatoes. My grandmother used to make what she called Tomato Relish–I'd call it salsa–and I'd love to make some. I did facebook like and am an email subscriber. I currently have a cobbled together set of older (not canning pots) pots, some strange racks that only keep things above bottom, not helpful to get out… I can mainly jam from my blackberries and plums (or combos of above). I'd so love a new, complete, totally designed for canning set! Thanks! I would love to can tomatoes. I can remember helping my Great Grandma with canning when I was a kid. I'd love to do it again. able to find in the stores. I'm about due to make another batch. Hello. I love canning and could always use an extra pot to have more than one waterbath going at the same time. This year I've canned 12 qts of tomatoes, varius kids of pickle relish, and the thing I'm most proud of, ketchup. It's delicious. I would love to learn how to can. My mom used to do it every year and we would live on the canned food all winter. It's funny how old is new again! One canner just isn't enough around here- I would love to have another! Just finished watermelon rind pickles this morning, about to pick red and yellow peppers for relish, and more tomatoes for sauce. Thanks! Thanks for this prize offer. Already can, freeze or dry the garden bounty. This year I tried a new idea; Pepper Relish, we have an over abundance of sweet bananna and gypsy peppers so let a few go to red and picked most green/yellow. Fast Pulse in the processor, process onion and thru in a few green tomatoes. Found a really good recipe for sweet relish and proceeded with that idea. Did a 15 minute water bath for pints. Yummy Yummy! Use just like pickle relish in salads etc. I just wanted to make a comment on the merits of canning, hope a newby wins! I made refrigerator pickles for the first time this year. I've frozen tomatoes, but this year I loaded up my freezer with grass-fed beef! And I keep looking at the canning supplies, but I blew my budget on that beef. Would love to win this kit! Thanks! Last year was my first garden experience. I froze a lot of tomato products i had made. This year I, too, made refrigerator pickles. Right now we are harvesting a lot of tomatoes and i was thinking of trying out canning this year. This would be a great giveaway to win. Thanks for the chance. My family and I like to go prickly pear hunting and it's fun to make jelly with the pears. I would love to have this to make canning easier when I make the jelly! Thank you. I haven't done any real canning yet, but I am dying to. I would love to make strawberry, blueberry and peach jam to eat in the winter months. I am an e-mail newsletter subscriber. We are going to start our garden from scratch next year since we had our house re-sided and we are redoing all our landscaping. I mostly stick to things like basil pesto, haven't done any canning yet, just freezing – but I would love to work with tomatoes and cucumbers! Thanks! I've put away tomato salsa and pesto so far this year. Pickles would be a possibility with that kit. Or my daughter would love it as she is getting into canning herself. When I commented on FB, I didn't know you were doing a giveaway. This would be a fantastic gift for a new gardener, and I know just the person. Thanks for the opportunity to win one. I would love to have a real water bath canner to replace the tall stockpot and cake rack setup I currently use. Hey there! I don't facebook so I hope this doesn't exclude me from the drawing. We have a small container garden…aaaah, the joys of apartment life. We have managed to dehydrate lots of herbs, peppers and flowers. We'd love to be able to can the tomato crop, though. Med bills will not allow for any new purchases this year so winning something would be fantastic! Thanks for the opportunity and keeping my fingers crossed! My neighbor and I are gardening at my house this year and we have been canning like crazy. I've got a water bath canner but the rack is rusty so a new set would be nice. We have canned tomatoes, green tomatoes, salsa, pickles, chow chow, relish, jams, etc. Love your blog! Can I sign up again? I have two emails and two FB accounts 😀 , I have posted this on just about ever site I know of … Trying to get either me our one of my buddies to win this 😀 It is so very very nice of you , and got alot of readers of your newsletter. What a great idea on your part, I pickle relish, pickles saurkraut, I am even going to pickle Garlic 😀 I also can Tomato chunks, toamato Salsa, Spaghetti sauce , I love to water bath instead of pressure canning, my old water bath canner used to belong to my husbands 92 year old mother. I think it is time for a new one 😀 w8in4dave at g mail dot com …. Well – Since I have a bonanza crop of tomatoes this year and I have roasted, dried and put them in oil. I think it's time to learn to can! My blog is http://www.romysrealm.blogspot.com I live on an island so my computer has become my window to the world. I have been dying to make pickles again. I canned about a dozen jars one year. They didn't make it through the end of autumn, let alone through the winter. The house smelled so good and pickle-y!! I always get lots of tomatoes and grapes coming in September and this would be a wonderful way to preserve them! We are getting more tomatoes than I can freeze, eat or give away from our garden. I want to start canning the tomato sauce so that we can use it over the winter. One of my fondest memories as a child is pickle day. That is the day grandpa would make the best dill pickles on earth. I would love to win this to start canning also and carry on that tradition. have never canned but would LOVE to start up!!! I have helped friends and it was so much fun! Unfortunately, my garden didn't make it this year due to the extreme heat in Texas, but some of the folks at the farmer's market did. So, I am buying from them and hoping I can put up enough for the winter. I make jelly and jam. I would love to do more preserving, but it's hard because I don't have the supplies I need. I successfully preserved meyer lemons from our neighbor's garden, but failed at trying to preserve peaches (the jar actually exploded!). I would love to win this! I liked this and am a subscriber! We had a TON of cucumbers this year and I would have loved to pickle them, but quite inconveniently had a baby right when the bumper crop seemed to hit! We gave away a lot of cucumbers. I have dozens of tomatoes on the vine still to ripen though. I always have more tomatoes and cucumbers then I know what to do with. Would love to try my hand at canning. I've made strawberry and blueberry jam and pickled some cauliflower so far. my husband loves to make salsa and we have SOO many tomatoes – thats what we would can! I would like to can jalapenos, salsa, & tomato sauce. Signed up for the newsletter and Liked on FB. Haven't canned anything in a long time. Not sure what I'd do. Maybe some blackberry preserves. Hi I have preserved rosemary and basil. I tried so hard to grow organic green bell peppers this year but they are only half the size they needed to be. I would love to have a canner to preserve all the veggies my son brings me. Thanks for the chance to win one. I would like to learn to can some jalapenos! ive never canned before. we just moved out and can finally grow things. i have no idea where to start! I am starting a container garden. I hope to have enough food to start canning I would love to win. Thanks for the chance. In sunny FL we seem to be able to grow tomatoes, so I would can sauce and salsa! I'm a subscriber and I'd love to can our green beans, corn, tomatoes,onions,etc. would love to start canning. this would be so useful and help with the bounty from the farmers market. I have wanted to learn to can forever so this would be a great start. I liked you on FB(alyce poalillo)and I signed up for your newsletter. My mother always canned so many vegetables and made pickles. I haven't done much myself except freezing foods. Our garden wasn't very productive this year but I'm sure next year will be better. So far this year I have made strawberry jam, and bread and butter pickles and some crabapple jelly. I'm hoping to can some tomatoes from my garden, if they ever ripen. This would be great to win, my old canning kettle is at least 30 years old. Thanks for having the contest! Thanks for the giveaway…subscribed via email & clicked the Facebook “Like” button. …we have tomatos & various hot peppers that we would love to “can” ! I always can tomatoes, green beans, carrots and beets! Even though you don't need the canner, I also do relish, pickeles, jelly. Thanks for playing, everyone! Your comments were fun to read, and if I could, I'd send each and every one of you a waterbath canner. But that's why I use Random.org to select the winner. And it selected comment #2. So congrats to [email protected]! I'll contact you via email. Love canning and have been canning everything for 25yrs! I'd love a new canner-I'm still using my late mother's and the poor rack (and the bottom of the canner) is pretty rusty! Just finished up some italian pepper rings. I used to do tomatoes when I was younger. Going through my second childhood now. HAHA. So that kit would be really nice to do it again. And a great improvement over the equipment I used to use. I also plan to do beans this year too, but by the blanch and freeze method you recently described.